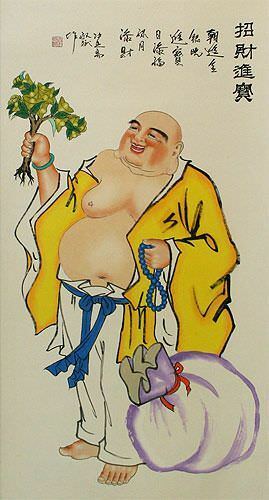 Artwork Panel: 53.8cm x 98cm ≈ 21¼" x 38½"
Silk/Brocade: 61.8cm x 154cm ≈ 24¼" x 60½"
Width at Wooden Knobs: 70.8cm ≈ 27¾"
This depicts the Happy Buddha. 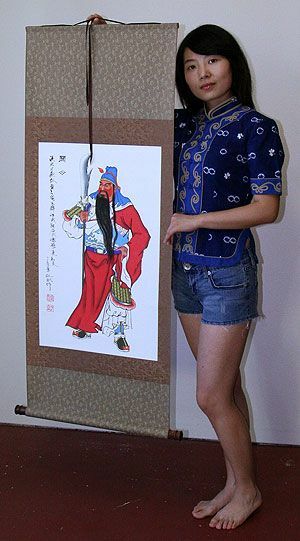 The actual title in Chinese is "Zhao Cai Jin Bao", which literally means "Bringing Money and Treasures". It's a good luck title that suggests this painting will bring such treasures to you. The smaller characters written on this scroll go on to suggest that a big belly can tolerate all intolerable things in the world. And a second line suggests that a smiling face is best used to make all the good people in the world to laugh with you.